Congratulations Team ESO – overall winners of the 2018 Intercollegiate Sports Day! This year’s event was the biggest yet, with the ESO Student Association welcoming fellow osteopathy students from Swansea, BCOM and the UCO to Boxley – a great opportunity for osteopathic students to meet, compete and socialise. Students took part in a range of individual and team events, including the 5k Run, Touch Rugby, Football, Volleyball, ‘Bubble Football’ and the grand finale – the Tug of War. As always there was a great atmosphere, despite the weather being slightly ‘changeable’, with teams and supporters enjoying music, drinks and a party at the end of the day. 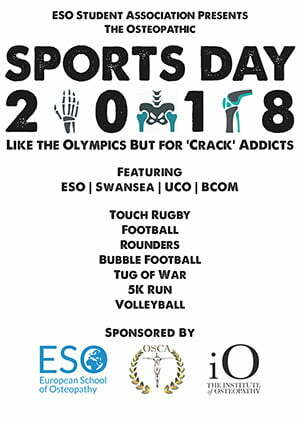 The Intercollegiate Sports Day is sponsored each year by the Institute of Osteopathy and the Osteopathic Sports Care Association (OSCA) UK – our thanks to them for their continued support. Thanks also to the ESO Student Association who do such a great job organising the event and to the visiting students who make the journey to Kent.